Joyce, Mariah, Sage, and Sandino. Question: How does the mode of transportation impact people’s emotional state as they head to the boardwalk? Hypothesis: Taking the trolley makes for a more magical experience of the boardwalk than traveling by foot, bike, car, or bus. We were interested in “how the mode of transportation (i.e. 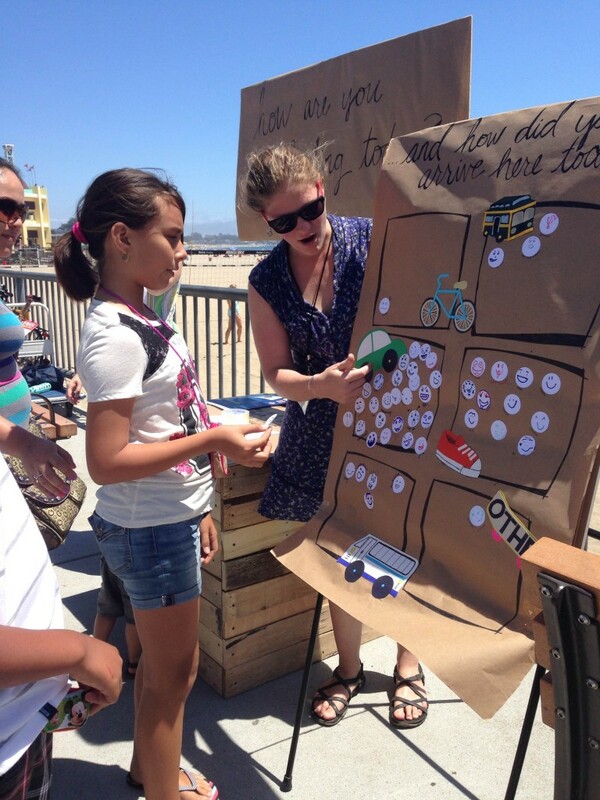 driving, walking, biking, etc) impacts a person’s experience of the Boardwalk. We viagra belgique hypothesized that people who drive have a less enjoyable experience at the boardwalk than people who walk, bike, or take the trolley. Feelings of....Awe, Excitement, Wonder, Stress/less stress, Joy, Magic, Frustration. 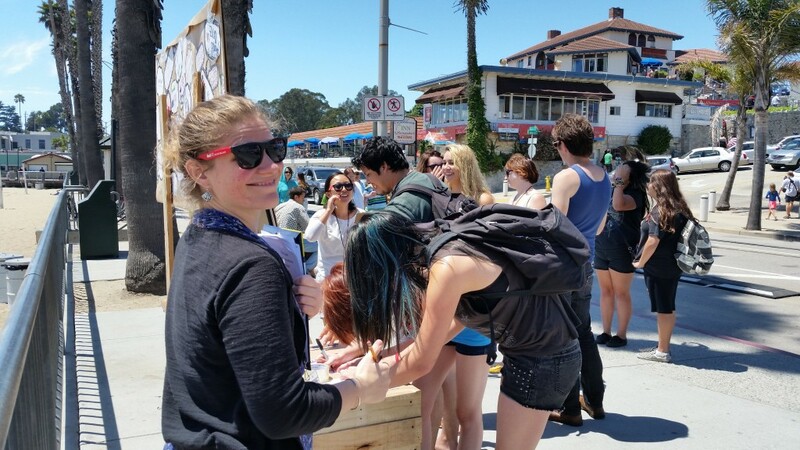 We set up at two locations near the Boardwalk, one by the trolley stop (near Monterey Bay Sanctuary Exploration Center) and one on Beach St. about 150 meters from the Arcade entrance. We asked beach/boardwalk goers to draw a picture to describe their mood and add it to our chart, indicating what mode of transportation they used to travel to the boardwalk. 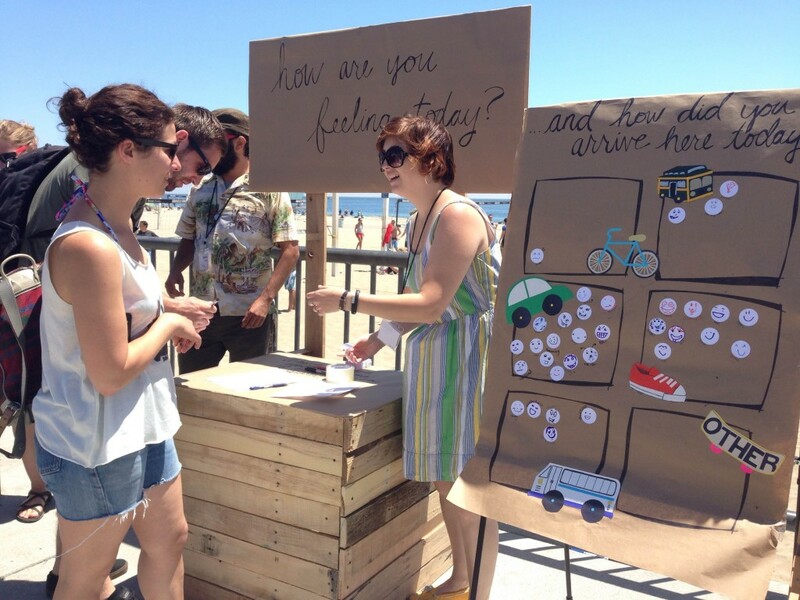 We were looking for trends in how people arrived and how they were feeling on the boardwalk. We also conducted some (crude) observations of people’s behavior, trying to track: smiles, laughter, conversations with strangers, cell phone use, and intergenerational interaction. It seemed that by the time we talked with people as they approached or left the boardwalk, most people indicated a positive emotion: Happy, Excited, Great, Silly, Content. Only 10 (of 104 people) indicated a negative emotion: Crappy, Exhausted, Back-pain. We attribute this to a number of factors. 1) The boardwalk is a happy place where people come to have a good time. 2) Even if people had a difficult or stressful parking experience they were now ready to have a good time. 3) Self-selection was a huge factor - people who seemed particularly stressed or frustrated often didn’t participate. 4) We didn’t have a way to compare/contrast who drove in as a passenger and who was the driver. We were also trying to give people a quick and easy way to participate and for the most part missed out on having in-depth conversations with people about their experience. We noticed that when we shared more explicitly what we were looking at – the correlation between travel and emotional state – people often told us more about their travel story or their thoughts on public transportation and traffic. We also learned that you are not allowed to display anything on the public sidewalks near the boardwalk and that only some of the police choose to enforce the law. 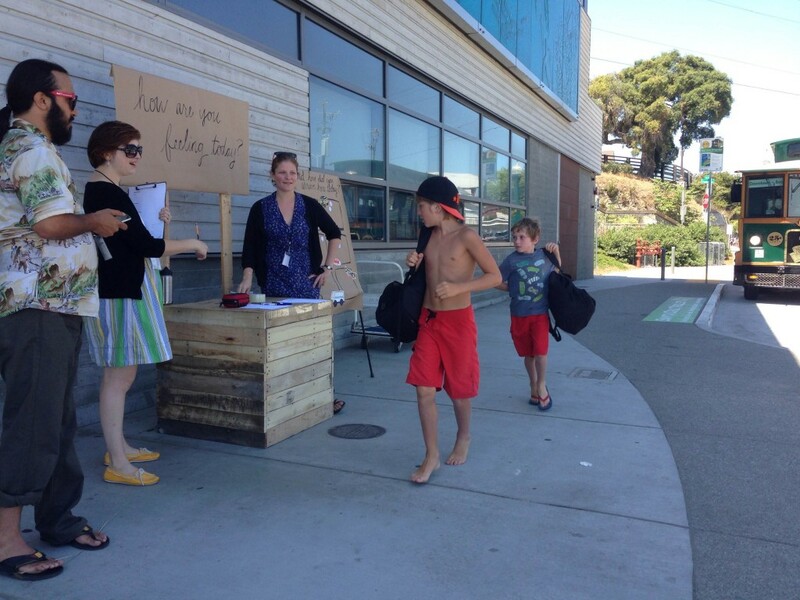 We were so excited to get 104 responses as well as talking with a number of other passerbys. Common excuse for not participating were hunger, running late, and being in a hurry. We found that kids who wanted to participate drew in their parent participation, and parents often thought the activity was geared toward children This project led to new questions and hypotheses about pubic art, methods of research, and language. We actually learned a lot about what gets people to partake in public art and participatory art near a commercial space.